ADVANCE STYLE – WHAT DO YOU SEE? To grow old gracefully – that’s what we are told. Are there rules on dressing once you hit 80 years? Should we not get to a stage in our lives where we think ‘F%&K it! 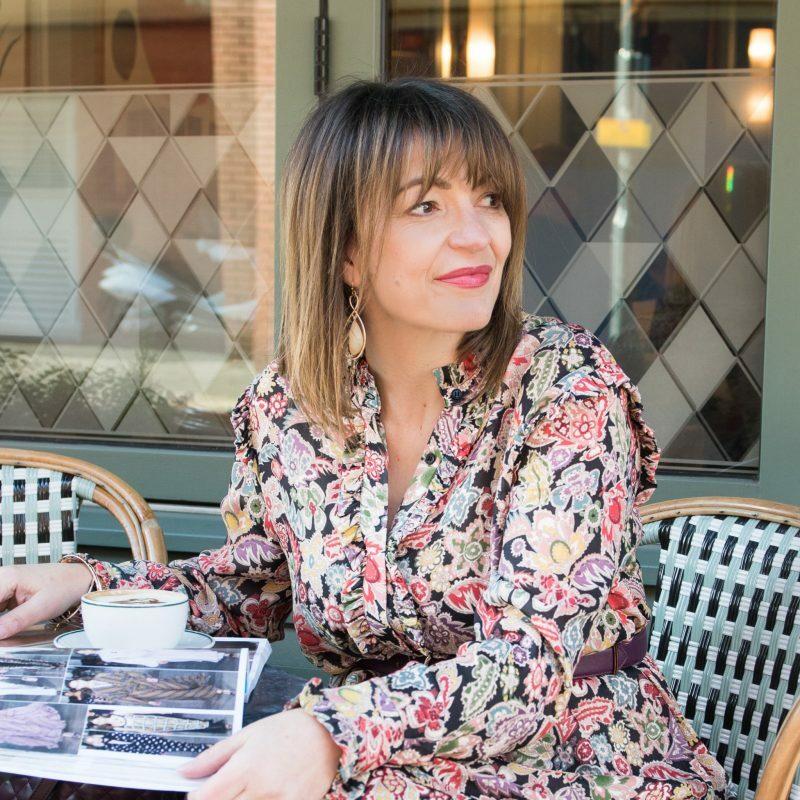 !” It seems to me that we are told throughout our lives what we should wear; we are told by our mother as a child, we are told by our friends when we hit teens; we are told by our boss when we start work and running alongside that we are told by magazines, celebrities and the list goes on and on. Should we always follow what everyone else is doing – where is individuality? Now the film below caused a bit of a stir on a Facebook group I belong to – is this style or are they clowns? What do you see? What I love about this film is how they all love to dress up each day, how they find it fun. How they hate to follow or copy what other people wear. They feel they get treated better by society because they make an effort to look good. And because they feel good, they are happy. I love their contentness and that’s surely got to be a good thing. I know I don’t want my life to get to a stage where I find beige and soft comfy shoes fabulous – please put me down if I ever say they are (this will be a sign that I have gone mad). I’m for glamour, for fun and to stay engaged with fashion, despite my age. I get a lot of my inspiration from Instagram, and as a huge fan on the glamorous ‘senior set’ I follow these three fabulous women, who are all still working, still having fun with fashion and to me they are very happy ladies. I know what I see. 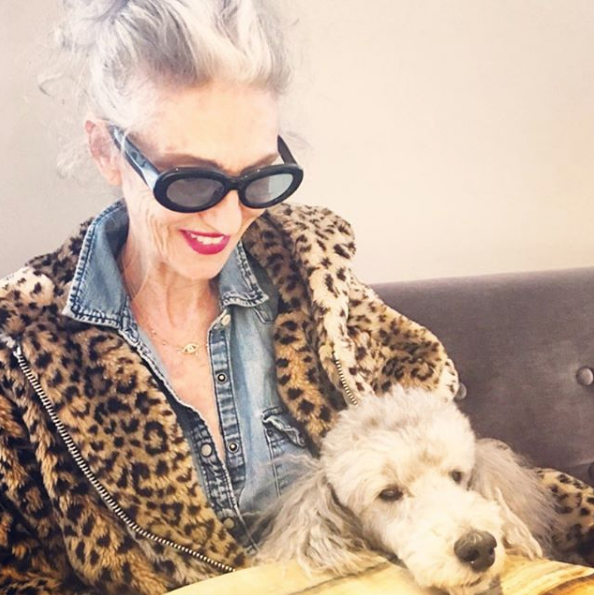 A model from the sixties, Linda Rodin is prolific on Instagram giving lots of insight into behind the scenes of her fashion shoots. I love this blue sofa (I may just have to copy), and of course I find myself admiring Linda and her poodle Winks – feels a bit like me and Alfonso. She’s also a lover of jeans – ditto. 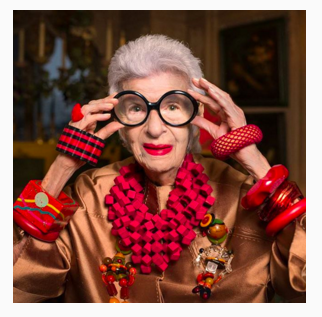 Iris is 95 years old and has recently launched a clothing line with Macy’s. I went to watch Iris’ film last year with my mum, a slightly strange documentary but well worth watching – she is unique. 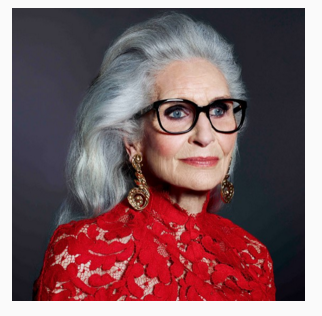 Daphne has been professional modelling since 1949, and she is still modelling today at the age of 88 – it seems modelling can have longevity if you stay modern and current.